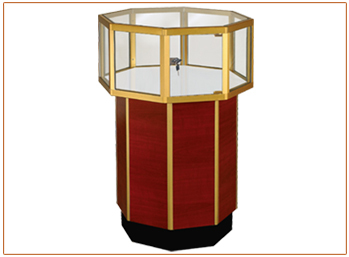 The overall height of an octagonal pedestal showcase is 38” high. Display area is 12” high and is available in 3 widths. The wood pedestals are 22” high with a 4” high black kick base. The pedestals on a standard case are closed; sorry, storage options are not available. The display area is accessible through a locking hinged glass swing door; 30” and 36” cases have two doors on opposite sides so the insides are easily reachable. To view more glass pedestal showcases from the Streamline Jewelry series, click here.